The Stampin’ Santa gave to you a snowflake candle luminary. I received this item as a Convention swap. I just had to make more. I used them for Teacher’s gifts. We filled them with candy and gave them the candle so they could turn it into a luminary. It’s made with the Fancy Favor Big Shot die. 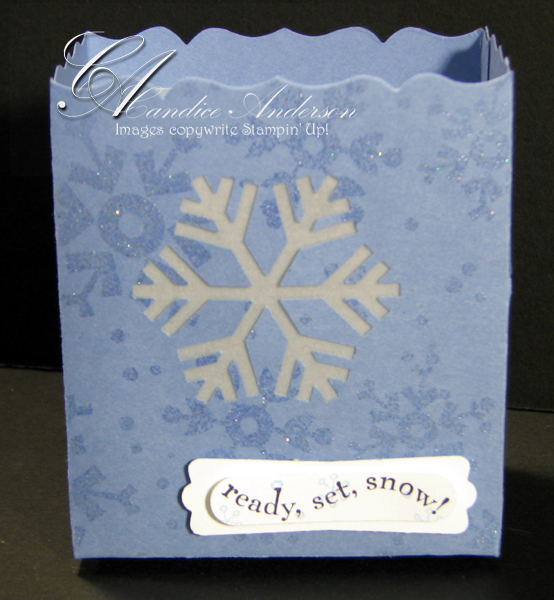 The snowflakes are rolled on with versa mark then I embossed them with the iridescent ice embossing powder. I punched out a snowflake on each side and covered it with White Vellum. They are finished off with the cute little “Ready Set Snow” stamp (from Best Wishes & More) on the front punched out with the word window punch and layered on the modern label punch. They were quick and easy to make. I love that they can be used for the whole winter season. Remember that I have the Big Shot on sale in my 12 Days of Christmas. Get it now and start having fun all year. This fun project is also one of the ones you can get for FREE when you place a $50.00 order. To order call me at 435-245-5321 (Home) or 435-232-2655 (Cell & Messages.) E-mail me at andersoncandice@hotmail.com. Order on-line at www.candiceanderson.stampinup.net. Click on the shop now in the upper right hand corner. Remember to check out my 12 Days of Christmas sale for all the great deals. Plus the 12 Days of Holiday Sale that Stampin’ Up! is offering on fun dies for the Big Shot.